Victoria boasts hundreds of registered buildings with historical status and Victoria Window Cleaning understands the importance of proper care. More than wiping spots off window surfaces, Victoria Window Cleaning is available to clean frames and sills. Our Gorillas work on properties up to three storeys. This enables a more thorough view of the condition of the window and surrounding areas. Let us sweat the details, so you don’t have to! Our Gorillas are trained and certified to give you the proper level of clean that you both need and deserve. Improper tools and techniques move dirt around the surface of windows and when wiped side to side, windows collect static electricity. This electrical charge attracts dirt and dust within the air that will rest on surfaces, making the window appear unclean even after wiping. Victoria boasts a long history with the Canadian Naval Fleet, its many piers and Harbours as well as whale watching. The waterfront plays a huge part in life and culture in Victoria and many businesses thrive off of their waterfront properties and views. With Victoria Window Washing behind you, you never need worry about patrons having an obscured view. 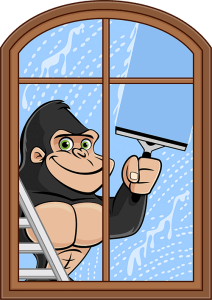 Our Gorillas are able to accommodate all of your Victoria Window Washing needs from three storeys and below. In addition to making views more pleasing and providing a crystal clear view of sparkling waters, clean windows can help with energy efficiency of your home or business. Clean windows allow the rays of the sun to pass through while keeping cool air outside. As weather begins to change from Summer to Fall, these small changes could make a great difference. You can see it in your heating bills as well as comfort within the home.